Legend has it that lion dancing originated in China during the Tang dynasty, when an Emperor was troubled by a nightmare, which ended after he was saved by a rare and strange beast Ñ the lion. An important part of New Year celebrations, lion dancing has long been associated with Southern Chinese systems of kung-fu, an association that dates back to the days of the Ching dynasty, when revolutionary martial artists used the lion dance as a secret means of communication. For today's student of kung-fu, the lion dance offers vigorous cardiovascular exercise as well as stance and weight training - all rolled up in one cultural package. Everyone who studies kung-fu soon realizes the value of learning traditional Chinese weapons in addition to empty-hand forms. Students are also introduced to the respect and courtesies due their sifu (teacher) and fellow practitioners. And most serious kung-fu students take the time to learn something about the culture that gave birth to, and nourished their martial art. However, one of the most important training and cultural aspects of Chinese martial arts is often overlooked by even the most serious of students. The lion dance, a subject with which every student of Southern kung-fu systems should be familiar, is one of Chinese martial arts most valued training methods Ñ and it is also an excellent source of historical information in regards to kung-fu. Unfortunately, lion dancing is often overlooked in many kung-fu schools that teach Southern Chinese styles. Lion dancing originated during the Tang dynasty (618-906 AD). Legend has it that the emperor had a dream one night in which a strange looking animal saved his life. The next morning, the emperor described the dream to his ministers. One minister told the emperor that the strange animal resembled a creature from the West, a lion. Since the strange animal saved the emperor in his dream, the lion quickly became a symbol of good luck throughout China. It was believed that a dancing lion chased away evil spirits. Today, lion dancing is still the most important opening ceremony for Chinese events and businesses. It's also a necessary ritual for businesses during the time of the Chinese New Year, for lion dancing evokes good luck in the upcoming year. Lions are not native to China, which explains why the "lion" in the dance acquired characteristics of the Chinese dragon and phoenix. Another reason kung-fu stylists perform the lion dance is that lion dancing gained its greatest fame during the period of the Ching dynasty when Chinese patriots were fomenting rebellions against their Ching (or Manchu) overlords. Lion dancing was performed from village to village under the guise of a celebration. In reality, revolutionary martial artists were exchanging information along with the money they collected to various revolutionary cells. During the celebration, the dancing lion ate lettuce as part of the dance routine Ñ and this lettuce often contained money and information hidden within its leaves. In revolutionary days, the dancer holding the lion's head would cry out choi ching ("get the Ching") to signal that he was a fellow revolutionary and could receive secret messages. Of course, any Ching informers present would know the dancer's intention upon hearing the battlecry. Therefore, since ching was very close in sound to chiang (meaning green, as in lettuce and money), the lion dancer's password became choi chiang or "get the green." Patriotic martial artists continued to recognize the lion dancer's yell as their secret password. Choi chiang is still used today as the traditional lion dancer's expression when he goes after the symbolic lettuce and good luck money. Lion dancing became particularly associated with Southern Chinese systems of kung-fu . One of the largest of these Southern systems is choy li fut. Founded in 1836 as a revolutionary fighting system, choy li fut has deep roots in lion dancing tradition. Doc-Fai Wong, a Grandmaster of choy li fut who teaches in San Francisco, California, is an expert on the art of lion dancing. In addition to being a highly regarded lion dancer, Wong has researched lion dancing extensively in the Orient. "Lion dancing is so important to kung-fu that to have Southern Chinese kung-fu without lion dancing is like having a flower without petals," Wong states emphatically. Usually two dancers perform as the lion: one dancer carries the head, another becomes the lion's tail. The lion head is characterized by quick, lively movements, and often the lion head is raised high r above the dancer. The footwork used by the lead dancer incorporates all of the various kung-fu stances and kicks. It is the dancer under the lion head who control the mouth, ear, and eye movements, establishing the lion's basic attitude. "Not only must the lion dancer under the head excel at kung-fu, but he has to understand and imitate the lion's expression and habits. The idea is to make the papier-mache lion appear real," Doc-Fai Wong remarks. But the dancer performing in the lion tail is equally important. He must duplicate the lead dancer's stances while remaining in an awkward, stooped posture Ñ and this dancer's vision is restricted. 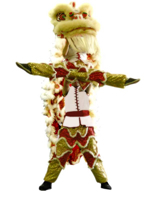 Both lion dancers must work especially on stance training to improve their strength: The heavy lion head requires a dancer with strong shoulders and arms; since the dancer in the lion tail is bent over all of the time, he must have a strong back and legs. There are also different types of lions that represent a variety of attitudes and that fit specific lion dancing ceremonies. A black lion is known as a fighting lion, and he represents youth, brings good luck, and likes to play. Wong reminisces about serious lion dancing traditions in ancient China: "In the old days the meeting of two black lions from different kung-fu schools at a lion dancing often meant a fight between the two rival schools. However, today the black lion is a symbol of kung-fu's history." The black lion's opposite is a flower-faced lion with a white beard. This lion represents maturity, wisdom, seniority, calm, and peace. A famous Chinese historical character, General Kwan Kung, is portrayed by a red-faced, black-bearded lion. The two colors illustrate Kwan Kung's righteousness and courage. A yellow lion represents Kwan Kung's older brother, General Liu Pi, and depicts his bravery and kindness. The black-faced, black-bearded fighting lion signifies the fearlessness of Kwan Kung's younger brother, General Chang Fei. The lion dancer's skill at both lion dancing and kung-fu is demonstrated by the routines that the kung-fu school performs. All routines begin with the opening good luck ceremony of bowing. The bowing ceremony represents a good luck greeting and is performed at the beginning and end of all lion dances. The cheerful Lion first rushes forward, then rolls his head clockwise, dragging his whiskers on the ground while retreating to his starting position. This ceremony is repeated three times in rapid succession as the lion demonstrates his humility and good nature. In the next act of the bowing ceremony, the lion walks a large circle while sniffing the air, pawing the ground, scratching himself, and acting surprised. The footwork of the dancers changes at this time according to the mood the dancers portray. Square stances, cross stances and regular walking all play their own roles in describing a lion's attitude. The legs of the dancer under the lion head represent the lion's front legs. When the lion is surprised, for example, the dancer raises the lion head high over his own head while assuming a cat stance. The routine that often follows the bowing ceremony is called suai si (" sleeping lion.") The lead dancer starts in a square stance position and slowly commences swinging the lion head back and forth as if the lion were falling asleep. The eyelids close half way. The dancer's right foot crosses in front of his left, tripping him, and he stumbles back into a square stance again, acting as if the lion awoke suddenly after nodding off. Again the lion's eyes droop and the head starts swinging slowly. The dancer under the lion head crosses his left foot and stumbles in the opposite direction to repeat the routine. At this point in the suai si routine, the lion wakes once more and looks around before deciding that he's too tired to continue. The dancer under the head crosses his legs into a lotus position and sits down while lowering the head to the floor. The dancer at the lion's tail follows in the same position. The ever-present lion dancing music now sets a slow, deliberate tempo as the lead dancer pulls the appropriate strings in the lion head to wiggle its ears. From there, the lion head moves from left to right with the mouth vibrating softly Ñ a sign that the lion is dreaming. As the lion dreams on the head moves faster and faster until the lead dancer sticks one leg forward and falls out of the lotus position. This awakens the lion who sees the leg sticking out. Thinking that there must be fleas attacking him, the lion gnaws on the leg. When finished with the fleas, the lion retracts his leg into a lotus position and returns to sleep. The dreaming and flea biting routine is repeated using the lead dancer's other leg. The routine continues to alternate between wakefulness and sleep: the lion looks up, and bites the air chasing flies; the lion mouth closes and slowly opens again, yawning. Following this show, the lion returns to his full waking state. At this time, the lead dancer's legs stick out in front of him in a "V" shape. The dancer closes his legs and the lion head makes motions as if the lion were licking his legs and biting his paws. The lion routine continues with the dancers imitating a big cat grooming himself. The lion strokes his whiskers, then scratches his ears with a paw, and then rubs his eyes. (In this last maneuver the lead dancer must pull his entire leg back and up to the lion's head.) The grooming routine is then repeated on the lion's other side. The lion becomes fully awake when he attacks mythical fleas on his flanks and scratches his chest. In this maneuver the dancer under the lion head lifts his legs up into a high split as the open-mouthed lion head bites at the dancer's buttocks which represent the lion's "chest". Both dancers then jump up into a square stance and stretch. The rear dancer will now stick one leg out to the side and shake it, indicating the rear is now attacked by fleas. The lion head turns, bites at the rear leg, returns to the front, stretches, looks up a few times, and then repeats his grooming with the other rear leg. Finally the lion's tail itches - which requires the rear dancer to vigorously shake his lion section. The head bites its rear by placing the lion's open mouth against the rear dancer, and then chasing its tail round in circles. Again the routine is repeated on the alternate side. Finally, the lion gives up and starts walking forward, ready to perform a new routine, si gee chut dung ("lion comes out of the cave"). The "lion comes out of the cave" is one of Doc-Fai Wong's specialties. It is executed with the aid of either two Chinese horse benches, two kung-fu banners on poles, or two people holding long Chinese weapons. The benches, banners, or long weapons represent the opening of a cave. The cautious lion closely stalks the cave's mouth. Fearful of possible attack, the lion frequently jumps back. Slowly, with the lead dancer walking in a light cat stance, the lion approaches the cave's mouth, sniffing the air cautiously and jumping back each time he gets too close. As the lion discovers that the cave is safe, the lion happily sniffs and licks the cave opening on each side. The lead dancer then raises the lion head on high to signify that all is well, and the lion is pleased. As the lion exits the cave in this routine, the sun strikes his eyes. The dancers now imitate the motions a big cat would make as the "eyes" in the lion head blink in protect at the brightness. To signify playing in the lion dance, both the head and tail sections roll to the left and then to the right. As the lion then walks a circle, he realizes he's hungry, and this leads into the most important segment of lion dancing, the choi chiang ("get the green") ceremony. There are many types of choi chiang. One very popular type is called tien chiang ("sky" or "heaven green"). A head of lettuce, filled with money for luck, is hung from a doorway or secured to a building's exterior - sometimes as high up as the third floor. If hanging from a tall doorway, the lead dancer might stand on his partner's (or partners' depending on the lion's size) shoulders to reach the prize with the lion head. For higher elevations, a long bamboo pole, on which lion dancer and lion head are carefully balanced, is necessary. Here is where exceptional skill and balance come into play. And for very high tien chiang, a pagoda of human bodies, stacked as much as one, three, five, ten, 15 or 20 high is formed - and the last level holds a table. The lead dancer balances on top of the table, with the lion head to capture the leafy prize. Another common choi chiang is dei chiang or ("earth green.") Although there are several varieties of dei chiang, the two most popular are soam sing bane yuet ("three stars surrounding the moon") and chat sing bune yuet ("seven stars surrounding the moon"). In " three stars surrounding the moon" the head of money-stuffed lettuce lies on the ground surrounded by three oranges or tangerines set in a triangle. This routine is usually performed by less-experienced lion dancers who haven't developed the skill and balance required for other choi chiang routines. Wong teaches this technique to beginning lion dancers as a basic exercise. The lion moves around the lettuce and oranges in a large circle, gradually narrowing the circle until the lion head can reach the offering. First, the lion takes each orange into his mouth. The lead dancer tears the fruit apart, throwing the pieces out of the lion's mouth and then kicking them into the air with his foot - as if the lion were spitting out the fruit's skin and pith. After the oranges, the lion picks up the lettuce, extracts the money, and repeats the spitting out process. Finally the lion proudly parades in a circle, indicating he's full and pleased. Doc-Fai Wong recalls during his youth as a lion dancer that hard coconuts would often be substituted for lettuce. The dancer under the lion's head had the monumental task of breaking through the coconut's sturdy shell without the aid of tools. The "seven stars surrounding the moon" requires more balance and steadier stance in execution. A large round pan containing a small amount of water, a few coins, seven oranges or tangerines, and a head of lettuce in the center is set out for the lion. First, the lion eats the seven oranges, again spitting the skin and pith out into the air. Next, the lead dancer jumps onto the rim of the pan, carefully balances himself, then reaches into the pan to remove the coins. These, too, he spits out - the coins represent rocks. Now the lettuce is removed from the pan; the dancer extracts the money and spits the lettuce out by hurling it out the mouthÑand then kicking it high into the air. Finally, the lion drinks the water (using a heavy towel to absorb the water). The lead dancer passes the towel back to his partner in the lion tail who squeezes the water out of the towel as if the lion were relieving himself. The lion head, with the dancer using his hand through the lion's mouth to hold the now empty pan, shows the audience that, as a good lion should, he's drunk and eaten everything. Si ji guo kiu ("lion crossing the bridge"): The simplest form of this routine uses a Chinese sawhorse bench. Three cups are placed near three of the four legs. The dancer in the lion head jumps up on top of the bench and carefully removes all three cups. Now the dancer moves to the opposite end of the bench where he bends overÑand still on top of the benchÑeats the oranges and lettuce lying on the ground. For those who are very experienced, there is the more difficult "lion crossing the bridge." With five benches forming a bridge (three overlapping one another on the bottom and two stacked, overlapped, on top) the dancer under the lion head leaps up on top of one end of the bridge and very carefully walks across the stacked benches to the other side, where he bends over to reach the food on the floor. Needless to say this requires superb balance. No lion dance is complete without lion dancing music. The instruments employed are a large Chinese drum, several sets of cymbals, and a heavy gong. The musicians always follow the lion's activities, rather than having the lion's movements choreographed to the music. Doc-Fai Wong emphasizes that, "Any kung.-fu student who performs lion dancing soon finds his stances are much stronger, his stamina is increased, and he possesses greater overall strength. Lion dancing provides cardiovascular exercise, stance training, and weight training all rolled into one cultural package."